This is the amazing fairy tale short story for kids. 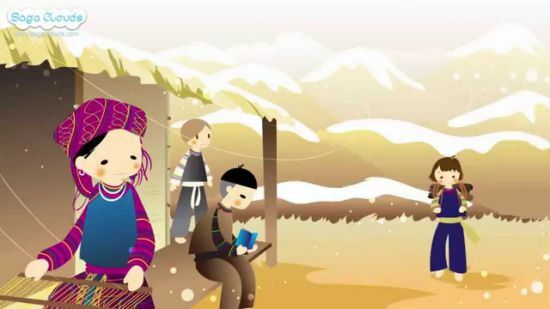 In a simple cottage at the foot of a snowy mountain, there was a mother working as a weaver. Every week, the mother would bring the carpets decorated with figures of different kinds of birds, trees and flowers to the market and sell them. The money earned would be used to raise her three growing sons. The youngest child was the only one who symphatized with her hardship. Everyday, he helped her collect wood sticks to use as fuel. Also, read The Candy Fairy. One day, when the mother was at the market, she saw a wonderful drawing. There was a castle leaning on the mountain, in the middle of flower gardens with the stream flowing around. Faraway on the hill, there were the sheep eating grass. The mother really loved the drawing. She decided to spend all her money on it. When she came home, she hung it at the most special place of the house and enjoyed looking at it all the time. Took the youngest son’s advice, she started to weave a big carpet imitating the drawing. She worked from early morning until midnight to raise the family and finish the carpet. It took her three years to finish the work. The mother hung her carpet up for everyone to see and they were all amazed by her talent. The scene of the carpet was half dreamy, half truly with the sun shining brightly over the purely blue water and there was also a castle lying in the middle of a colorful flower garden. Everything was perfect! You may also like to read, The Woodcutter And The Troll. But suddenly, a strong wind flew by and carried the carpet away. After that, the mother was badly sick. She didn’t want to take medicines. But she kept looking at the sky outside the window. The oldest son decided to leave home, heading to the East to find the carpet back. He kept going and going, but never came back. Then, the second son was also determined to go. But once again, he disappeared just like his brother. Seeing his mother became weaker day by day, the third son decided to start his journey seeking for the carpet. He kept going until he reached a glen. He met an old woman and a stony horse. She told him that the fairies on the shining mountain had borrowed his mother’s carpet to weave their own painting. To get to the shining mountain, he had to pass several volcanoes and frozen sea with a stone horse. Then, she gave him a bag of gold. She said that she had given everyone who paseed by the same gold bags. His brothers also received the bags but they used the gold to get into the city. They probably forgot about their sick mother who was waiting for them at home. Also, read The Magic Millstone. To make the horse move, following the old woman’s instructions, he drew his teeth and put them on to the horse’s mouth. The horse was revived. It carried him through volcanoes and frozen sea and finally to the crystal palace located on a mountain. His mother’s lovely carpet was being used as the pattern for the fairies to make their own carpet. The fairy admired the courageous and pious boy, especially the fairy in red gown. They only asked to borrow the painting for one more night to finish their own work. The fairy in red gown secretly embroidered her own image on the carpet. At that time, the boy suddenly felt sleepy and gradually fell asleep. When he woke up, he found out that he was lying on the flying carpet. It took him home in just a blink. The mother sat up from the bed and asked son to strtch the carpet on the floor so she could see it. Magically, the carpet kept expanding. The details in the painting turned into real things. You may also like to read, The Angel’s New Coat. The mother stood there, speechless, looking at the dream castle, the garden that was full of flowers and fruits, the broad hill, the sheep, everything was picturesque. And the son, he was frozen looking at the gorgeous girl standing on the strand of the lake. They saw each other and realized that their beloved one was right in front of them. Afterwards, the youngest son get married to the red gown fairy he met on the shining mountain. Their family lived happily in that dreamy castle, ever after.